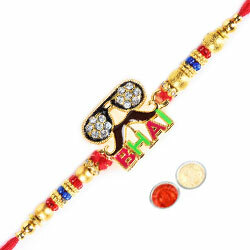 Surprise your loving brother by gifting him this Colourful Bhai Rakhi studded with Stones & Red, Blue or Golden Beads. This pack comes with free Message Card, Roli Tika & Chawal. So we wish you a very happy & prosperous Raksha Bandhan.